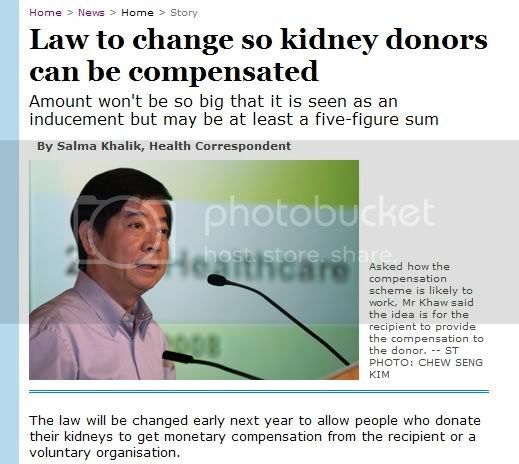 In an article in the Sunday Times on 2 Nov 2008, the Minister for Health, Mr Khaw Boon Wan, announced that he planned to amend the Human Organ Transplant Act to allow people who donate their kidneys to get monetary compensation from the recipient or a voluntary organization. He said that “the World Health Organisation, and countries such as the United States believe that it is ethical to compensate donors so they do not suffer for their act of altruism.” He hinted that the sum will be “at least five figures, possibly six”. However, such an approach and argument is flawed on three counts. First, altruism is “the fact of caring about the needs and happiness of other people more than your own.” Such acts are considered noble and worthy of admiration precisely because there is no material benefit – the altruistic person receives only the acknowledgement from one’s peers for their act of self-sacrifice. Such people and such acts are valued because they encourage the suppression of individual need for the good of others and for the good of the greater community. The greater the capacity of a society to do this, the better it is able to survive difficult times. The act of compensating donors for kidneys removes the altruistic component from the act, and makes it a commercial transaction. By allowing compensation, we are saying that as a society, that we value altruistic acts less, and that with money and power, all things, including the denial of death, is possible. It will encourage individualism, and a “me first” mentality found in some other countries. This cannot possibly be good for us as a nation. Second, organ trading will exacerbate the rich-poor divide. In an environment where all prospective recipients are in a queue regardless of whether they are rich or poor, all are treated equally, and the lives of both rich and poor are valued equally. Legalising organ trading creates an environment where those who can afford it “bypass the queue” – immediately creating the preferential treatment of one group over another. Poor or even middle-class Singaporeans are unlikely to be able to afford sums that are five or six figures. Arguing that “the National Kidney Foundation could step in to help” does not work in a situation where a suitable donor for two prospective recipients with hard to match donor requirements are in competition for a single kidney. Would the wealthy recipient outbid the National Kidney Foundation? Would a poor or middle-class Singaporean die because he wasn’t rich enough to afford a kidney? In addition, one would ask if the National Kidney Foundation, even with its considerable reserves, would be able to fund more than a few six digit kidney acquisitions, and if so, are the funds best used in the interests of these very few? In the National Longevity Insurance Committee (NLIC) Report, Professor Lim Pin noted that there were public concerns that “the scheme benefits those who are wealthier as they will live longer”. However, the NLIC noted that “there is as yet no robust local data to support the use of any other factor (apart from age and gender) to price the premiums”. The NLIC Report is silent as to whether such robust data exists in other countries, and did not propose that we try to obtain such robust data before making a key policy decision. Perhaps the NLIC might provide a reason for not making such a recommendation. Will legalising organ trading allow the rich to live longer? Will it create a situation where where the poor and middle class end up subsidising the rich when the National Lifelong Income Scheme kicks in? Third, legalising organ trading retards the search for alternatives. A wealthy cancer patient may, in recognition and acceptance of his impending death, and in a true act of altruism, use his wealth to support cancer research, so that others need not suffer the same pain. A wealthy individual suffering from kidney failure may instead choose to “compensate” a “donor” lavishly. The incentive to do something for the common good is removed, and is instead replaced by a private transaction where only individuals benefit. By making it possible to easily harvest organs from the poor, we reduce the incentive and desire to create fully artificial organs such as the Jarvik 2000 artificial heart . Some have argued that banning organ trading is ineffective, since the wealthy may go overseas and obtain organs from willing “donors” anyway, and legalising organ trading is a means to protect the interests of the “donors”. This thinking is inconsistent and somewhat skewed. In the first place, while it is true that banning organ trading in Singapore may encourage some to go overseas to obtain what they cannot obtain legally in Singapore, it is not sufficient reason to make it legal. If it were so, then we should not ban sexual relations between men and underaged girls in Singapore, since it would encourage some men to go to our neighbouring countries to seek this illicit pleasure. Second, it is not clear that getting someone to undergo significant risks to his health, and to jeopardize his future well-being for the sake of some money, is in his best interests. Just as it is not necessarily in someone’s best interests to offer him cheap and easy credit for him to buy a house that he could not ordinarily afford. A truly altruistic act, in the interests of a person in such dire straits as to be willing to give up a kidney for “compensation”, would be to use the money as an outright donation, to build infrastructure or otherwise improve the local economy. In summary, legalising organ trading diminishes the value of altruism and encourages a “me first” mentality, divides the nation into “haves and have-nots”, and retards the search for alternatives to harvesting organs from poor people. Rich or poor, powerful or weak, smart or simple, we come into this world naked, and naked we will leave this world. Death is the great leveller. Let us come to a graceful acceptance of it, and not choose to exploit those less fortunate than us.